I was so excited when Laurie Wisbrun sent me some of her new Llook! Llamas! fabrics she self-produces and prints through Spoonflower – I think the llamas are absolutely adorable and the coordinating prints are a perfect complement. My immediate thought was to fussy cut those llamas and set the blocks on point. I went with some solids and prints in some punchy and vibrant colors and made up some simple blocks. Many years ago, I lived in a town a bit further South from here and on my way to work I passed a farm with a camel. For some reason we thought it was funny to give the camel my brother’s middle name, so he’ll always be known as Evan the Camel. (Ryan never found it as funny as we did!) Anyway, the llamas in this quilt remind me of Evan, and consequently bring a smile to my face each time I see them. I used up extra prints for four large blocks for the backing. Complete with a few extra llamas hanging out on the back! I quilted it simply with straight lines on either side of each seam and bound it with a print from the Hope Valley line. It’s washed and dried and I’m totally in love! I absolutely love making quilts, but I also really love taking photos of them once they’re finished! I keep a mental list of great photo spots, and am constantly on the lookout for new spots. A llama farm wasn’t on that list, but of course, when needing to take a photo of a quilt featuring lovely llamas, I knew I had to find me some llamas! Luckily we were able to find these friendly and curious llamas not too far from our house. The three wonderful prints from Laurie's Llook! Llamas! line can be purchased here in her shop! This entry was posted in [search] Square-in-Square Quilts, Quilts and tagged handmade, laurie wisbrun, llook llamas, quilt, quilting, spoonflower. Bookmark the permalink. Your quilt is wonderful! I love the llamas too. that quilt is amazing… i love it! the fabric is super cute and bravo for self producing to your friend… applause for taking the bull (or llamas) by the horns (or ears)… smile. 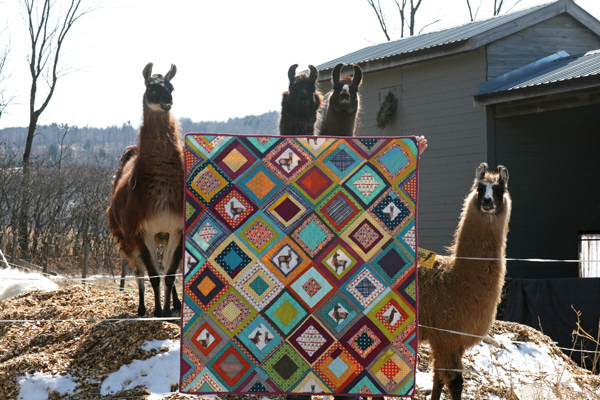 oh that’s too funny – totally love your quilt shots with the llamas! You have a great eye for quilts and photography. I will have to start seeking them out myself. That 1st picture is awesome (and hysterical)! The quilt is great too! Great quilt and even greater that you found Llamas to be in the photo with it! Ashley,II ‘ve read every sing blog post of yours (I found your blog and went and read all of your posts when I did) and I love what you do, and I enjoy seeing pictures of Max since he’s a week older than my son… but hands down this is my favorite post EVER. Llamas are my favorite animals, and I think you found the best herd for this shoot! Great quilt I love the colours. Unfortunately llamas always remind me of this song http://www.youtube.com/watch?v=6unpIYFoheE It’s from the Horrible Histories series and my daughters love it. Very wicked English sense of humor needed to appreciate it though. My German relatives find it all very confusing. This is probably my favorite quilt of yours!!! I love the bright colors of Laurie’s fabrics. Thank you for sharing more about why you make each quilt! I can’t believe how fast you got this one quilted!!! Oh my goodness I love this! The quilt makes me so happy and the llamas are just as awesome! I love it! In one of the pictures the llams almost look like they are smiling because they are enjoying the hommage of your quilt (or at least that is how it looks to me!). I check your blog often to admire your beautiful quilts, I don’t normally leave a comment but today I had too. The quilt hanging up in front of those llama’s made me laugh out loud!! They look so cute standing there, likely wondering what in the world your doing. Great quilt! I have some of this fabulous fabric and can’t wait to start playing with it. Your quilt is so fun, and the photo op is great! Okay, those llamas are hilarious! What a funny photo shoot. That one in the last photo with his ears back looks like he wants to spit at you. The quilt is great. Perfect use of those fabrics! OH, this is hilarious. Thanks! Love it. i had a friend in college that was nicknamed critter for some reason and one day we decided to call him critter the llama. it seems so silly but we all loved it, even he did. for a while we just called him llama. ha! love the quilt! I am always so excited when you have a new post!! Today was exceptional. Love all the Llamas and of course the quilt!! Thanks for putting a giggle in my morning. What a great set of photos. Love the quilt too. love the quilt and the photos, the hat print, too. thanks for sharing your talent! How cute are those llamas?! I just wanted to say that I absolutely love the back of this quilt (don’t get me wrong, the front is beautiful too). But I could see the back as the front of another quilt. Beautiful quilt! My in-laws own llamas. The one in the last picture with the ears folded back doesn’t like you. The others think you are great! Your llama quilt is so cute. Aren’t llamas the most curious animals? We have a farm about 40 mi. from where I live and I want to do a pillow for the lady and a llama quilt for myself. I love the bright colors you used. Props to you for finding a llama farm for these pics. Not only do the llamas seem happy to pose with the quilt, they seem to be peeking out the side, making sure you’re not covering them up with the quilt! I want that first picture blown up on my wall forever Ashley….so so funny! Love the quilt and love the llamas although some of them don’t look too happy! The color choices in this quilt are so inspiring – you have such a knack for mixing and matching fabric. Also, llove the llamas! Did they hum at you? “If I Had a Million Dollars”, I’d buy you an exotic pet… like a llama or an emu. I know that camel. I’m from Burlington originally but live in NY now and frequently head north to see my family in Vermont. We always look for the camel. He has been around a really long time. And I love the quilt–so cute! Oh that was just perfect! I love the last shot, the erstwhile production assistant obtaining approval for shooting….did you get the llamas to sign a talent release form? Too gorgeous….and love the quilt too! LOL!! You crack me up! 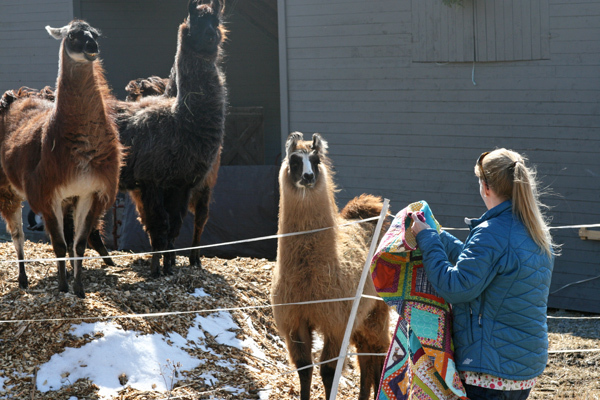 I loved seeing real llamas with your quilt. So inspired. Did baby boy get to see the llamas too? No one can ever say you’re not dedicated to taking awesome pictures with your quilts 🙂 The llamas totally made me laugh. Love the quilt! You would probably like the book for children called “Is Your Mama a Llama?” It comes in a board book for your boy. One of my faves when my son was young and one I like to give as a gift, too. That top picture is going to be a classic, iconic llama image for sure. Great photo shoot! My kids would love this (they are in bed right now though). Very nice quilt. I just love the pics with their little heads peaking out. So funny. I’ve always wanted a llama, since seeing “the emperors new groove” when I was a kid. Its a must see, if you haven’t already! You are too funny. And they seem to be very curious about everything going on. In college I dated a boy from Peru and he gave me a small llama that looks to be a miniature of one. I’ve always treasured it. Now I need to get some llama fabric. Love your quilt and thanks for the chuckle! um, i can’t believe you went and found some real llamas! so epic. Those llamas are driving me CRAZY!!! So darn cute and your quilt has inspired me to make one for a new baby boy across the street! Very CUTE!!! PERFECT photo shoot! I always love your creativity in picking locations for your quilts. but you have raised the bar way too far this time, missy. 🙂 I just love it! your quilt is wonderful. front AND back. nice work, Ashley! Love your quilt-I just got some of this fabric from Laurie last week. The pictures are wonderful too, made my day. I start each day at the office by reading your updates, and todays Llamas are just delightful. Your quilts are amazing and coupled with your creative photography are a highlight of my day. Thank you. 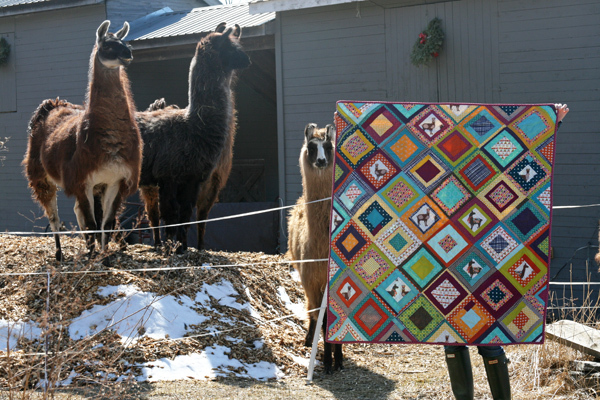 ROFL, I love that you found llamas just to take a photo of this quilt! Brrrr I’d love to win this gorgeous bundle of fabrics . It looks like a lot of fun , especially the polar bears. Thanks for the chance to . I really love the back with the lama fabric.. fun fun stuff! And the photo shoot is great… now you need to have her design some camel fabric. wink! 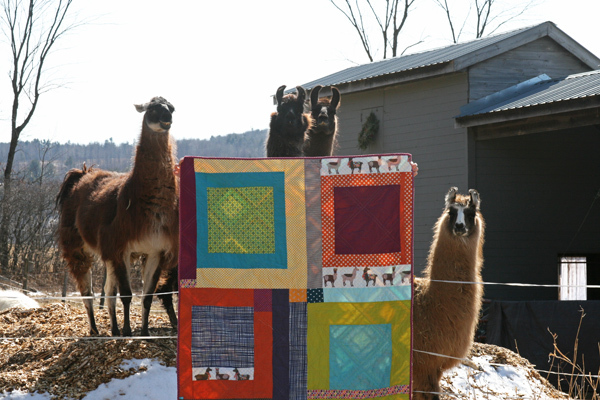 Love how well you trained the llamas to stand by your pretty and clever quilt. Thanks for sharing. 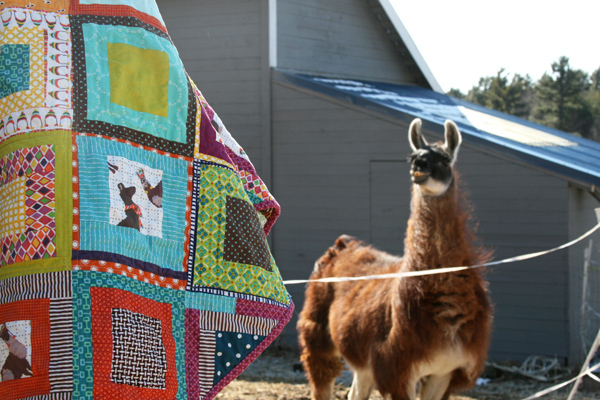 Great post, love the llamas & the quilt. Thanks for sharing! 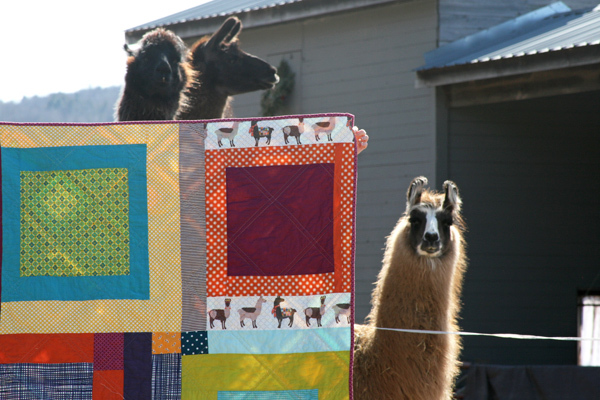 I was just looking at all your quilts and saw this one with the llamas and they’re such funny pictures!! I love the quilt and the llamas!